Hello, hello! 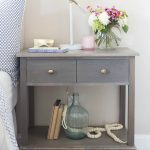 My name is Angie from House Becoming Home–a blog that documents my DIY furniture builds and various home improvement projects. 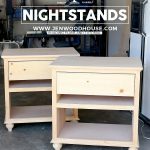 I’m thrilled to be part of the Jen Woodhouse 2018 creative team, and today I’m sharing photos and instructions for a DIY floating nightstand that I recently built for my husband Jim. I’m not sure about you, but I always seem to ignore one or two rooms in my home. Ignore, as in, when it comes to decorating and “making nice,” they get very little attention. Our master bedroom has possibly been the most “ignored” room in our home since we moved in about three and a half years ago. We had so much going on at the time (renovating the kitchen, laying hardwood flooring, etc. etc. 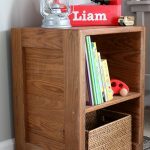 ), that when it came time to move in, we set up our bed and a few old bookcases and called it good. 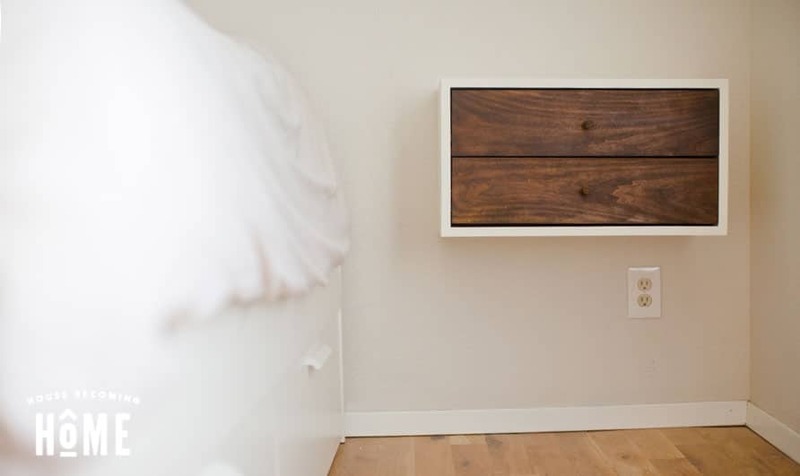 No framed photos or artwork, no dresser, no nightstands. 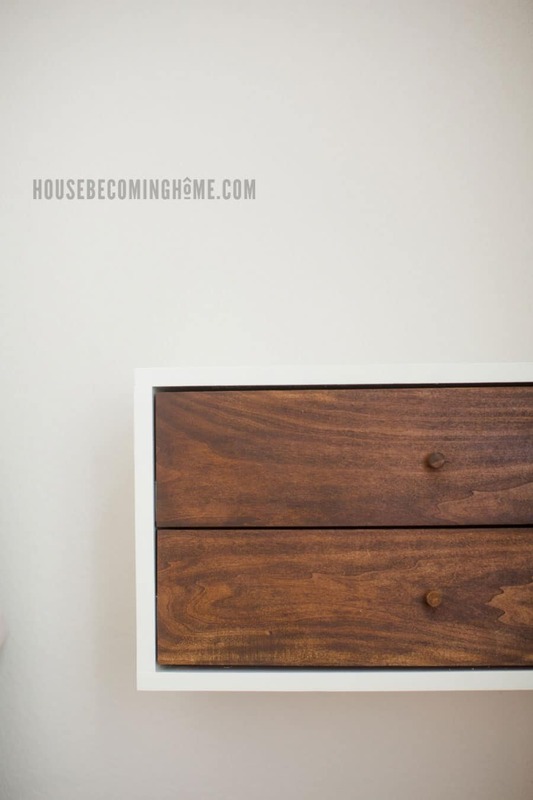 Last year, I finally found some time to build a huge eight-drawer dresser, and at the beginning of 2018 I decided it was time to add a DIY floating nightstand to Jim’s side of the bed. 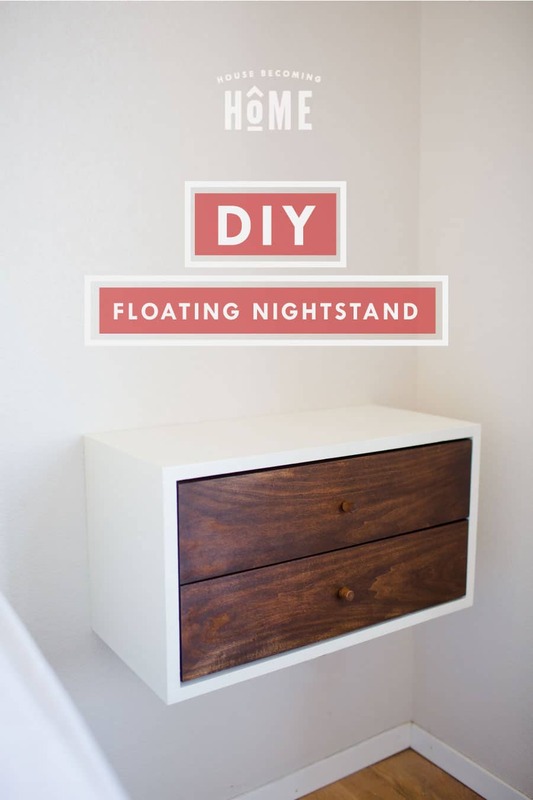 This DIY floating nightstand is a simple build that doesn’t take much time at all to finish. So let’s get to it. *Note: because the dimensions of the nightstand are relatively small, I tried to use as many pieces from my scrap pile as possible. 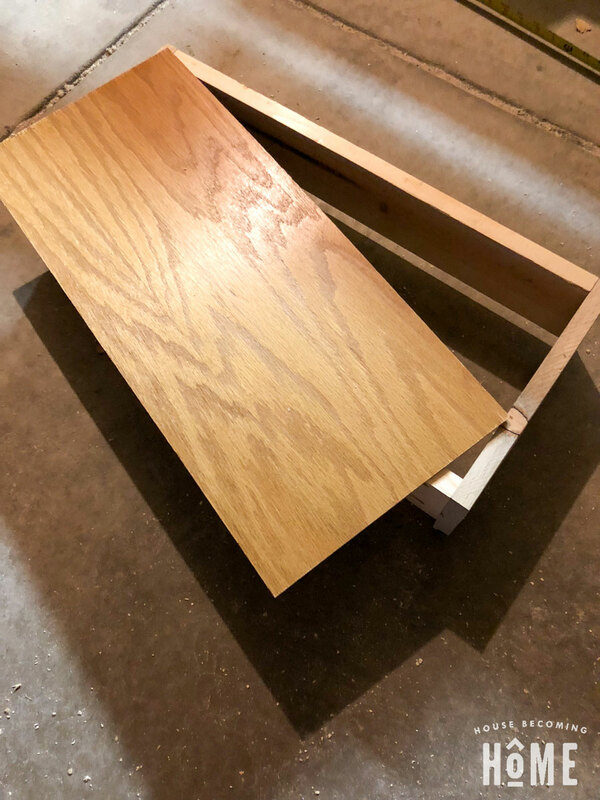 One of my drawers was made using a 1×4, but the other was made with leftover pieces of pine from a feature wall that my friend removed from her house. 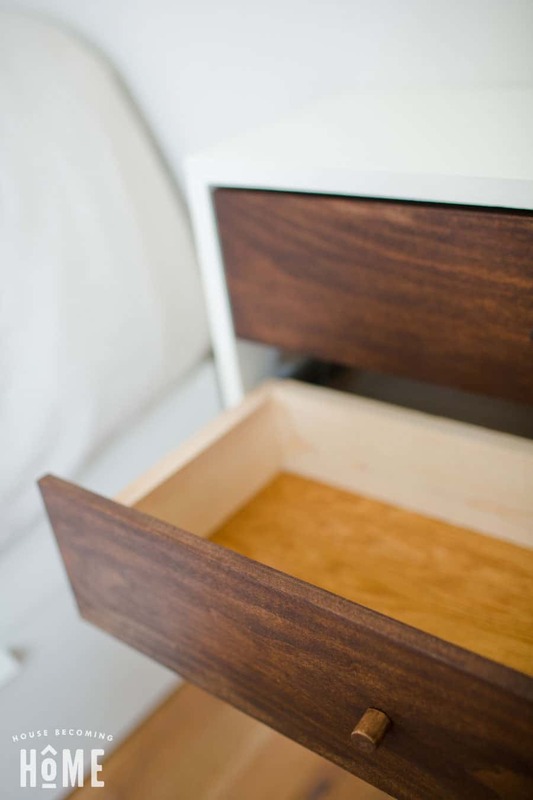 For simplicity’s sake, this list assumes you’ll only use 1x4s for the drawers, but if you have scraps, use them up! 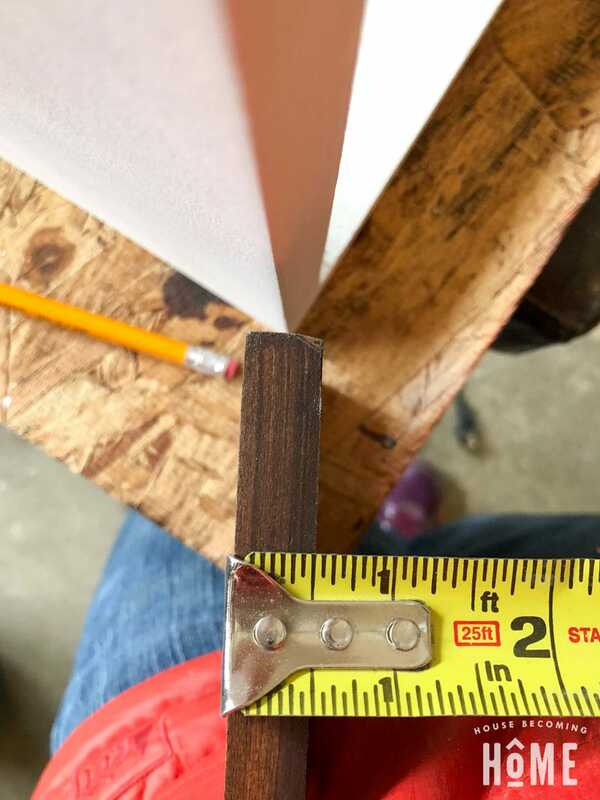 Just be sure to adjust the cuts if the thickness of your material isn’t 3/4″ like a 1×4. 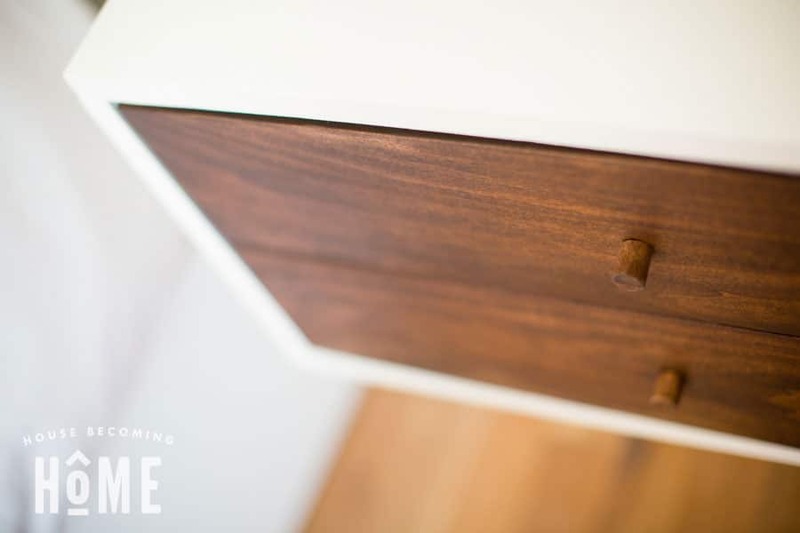 Finishing products of your choice–stain, paint, wax, polyurethane, etc. Cut a six-foot 1×12 into four pieces: two @ 24″ (top & bottom) and two @ 11 1/2″ (sides). 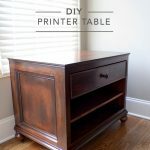 Make four pocket holes on the top and bottom of both of the shorter pieces (nightstand sides). 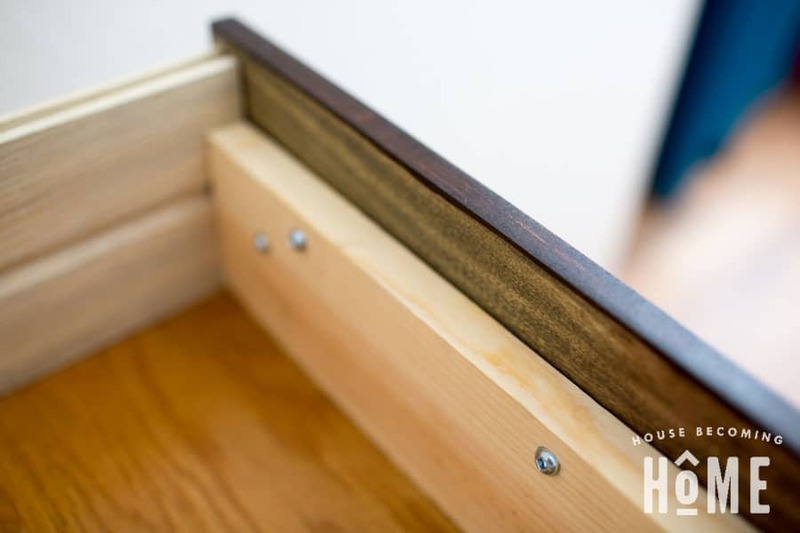 With the pocket holes facing in, assemble the shell of the nightstand with 1 1/4″ pocket hole screws. 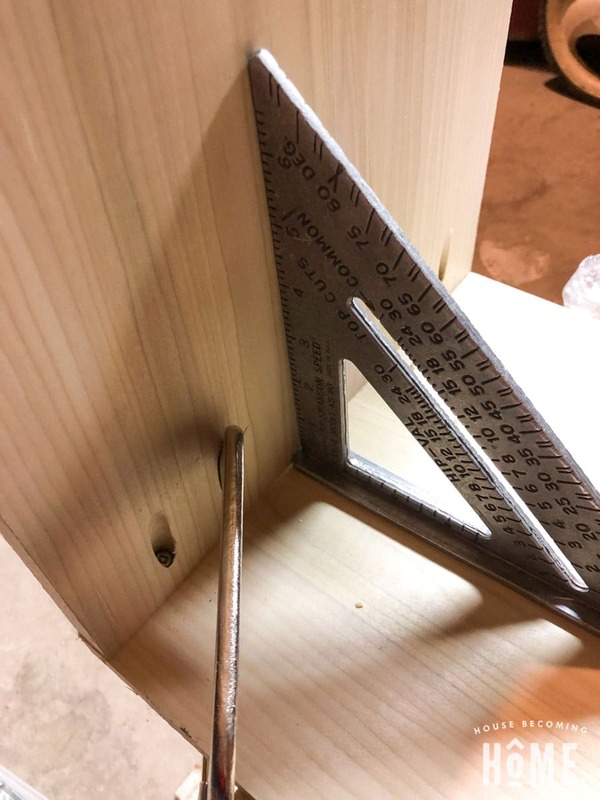 Use a carpenter square to ensure you’re keeping everything square. 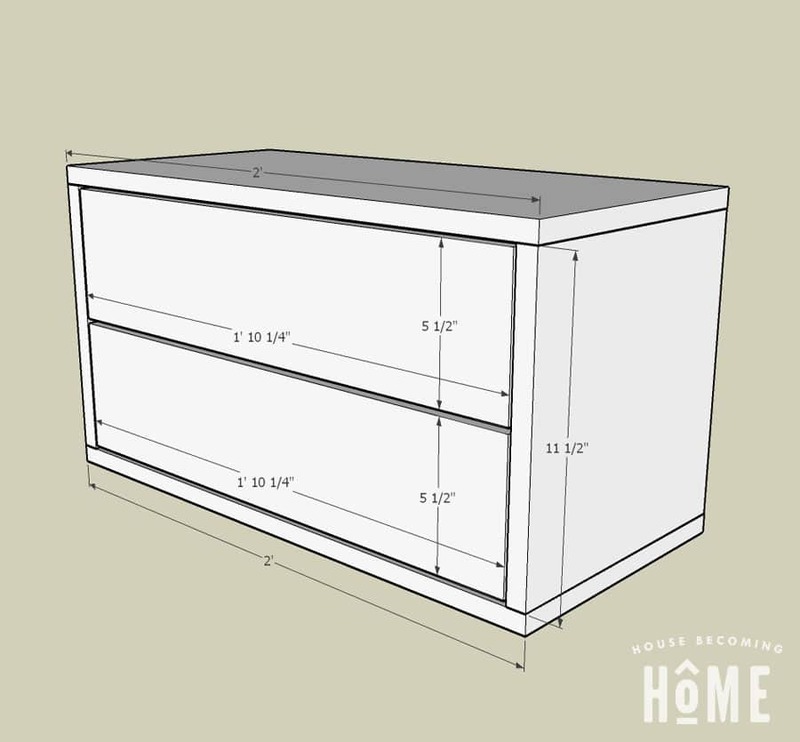 Build two drawers using the 1×4 cut to 20″ for the fronts and backs, and 9 3/4″ for the sides. I made pocket holes on the front and back pieces. 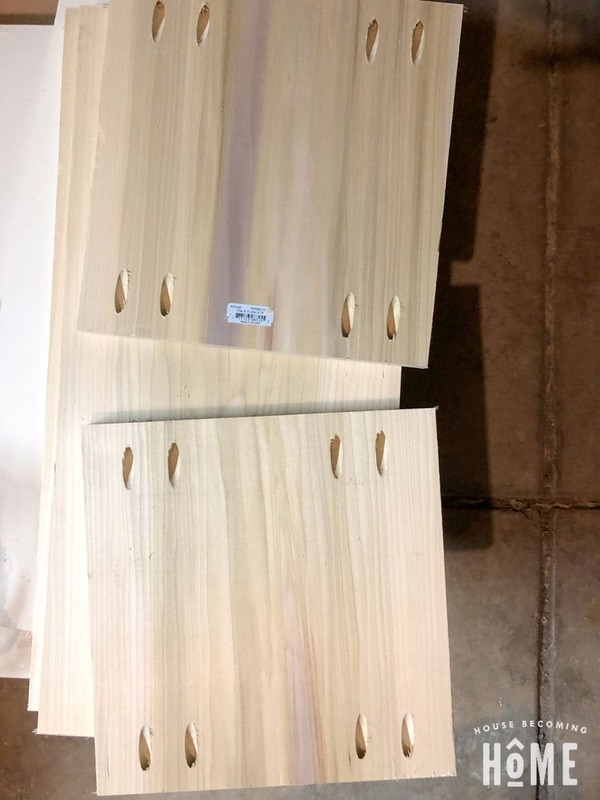 The pocket holes in the back will never be visible and the pocket holes in the front will be covered by the drawer face. 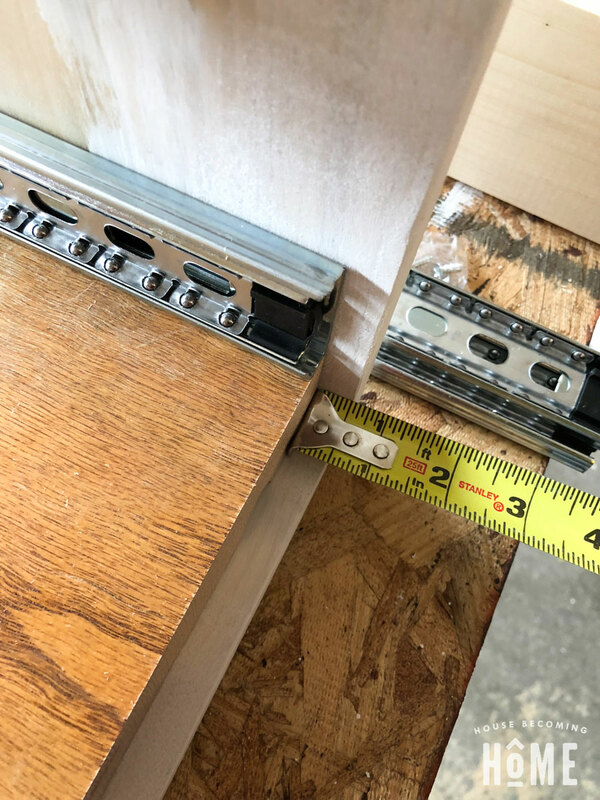 Install slides 1/2″ back from the front of the nightstand. 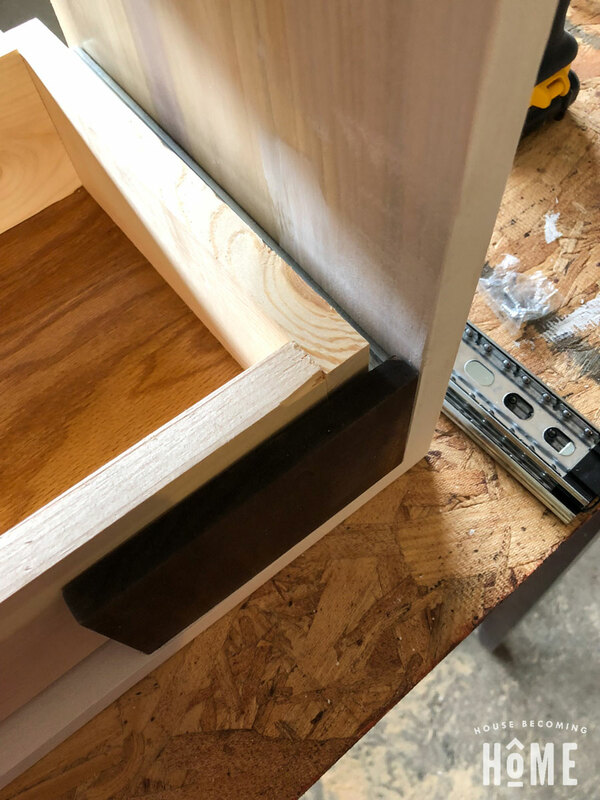 The oak here is just a scrap piece that I rest the slide on to ensure each slide is mounted at the same height. 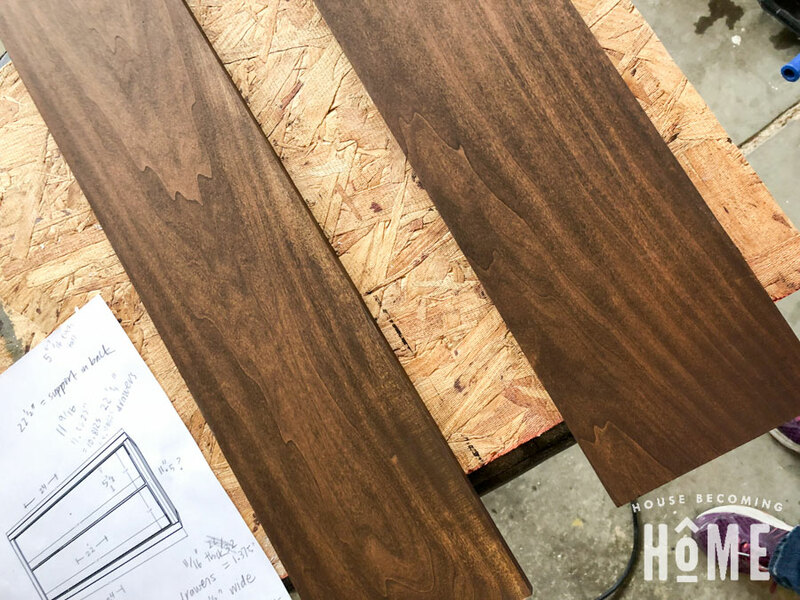 Cut two drawer faces to size (22 1/4″) and finish them to your choice–I used a dark stain followed by a protective coat of wax. 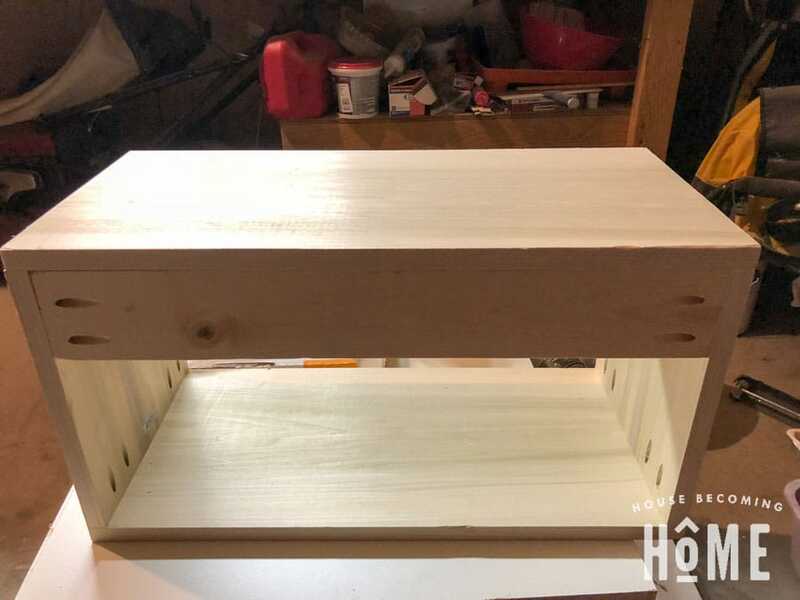 Attach drawer fronts to drawers with wood glue, leaving about 1/8″ gap on all sides. 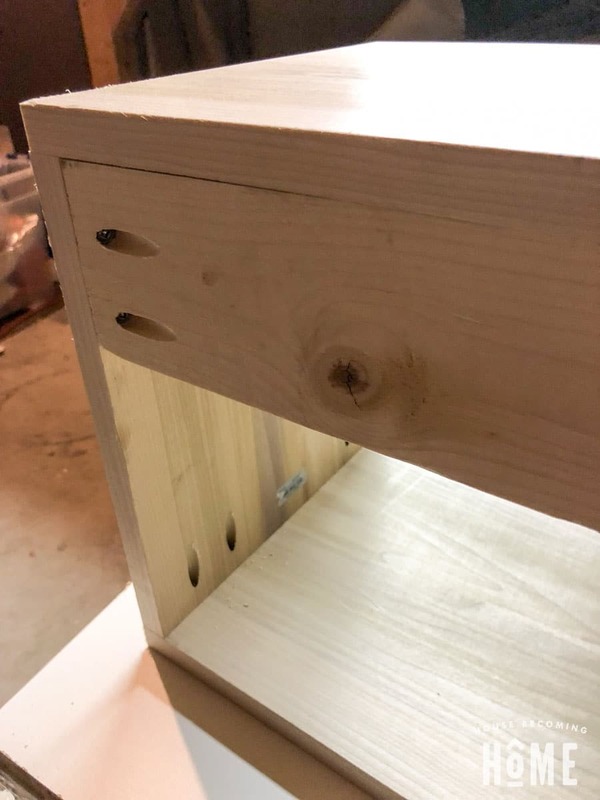 Once dry, secure with screws (screw from the inside of the drawer). 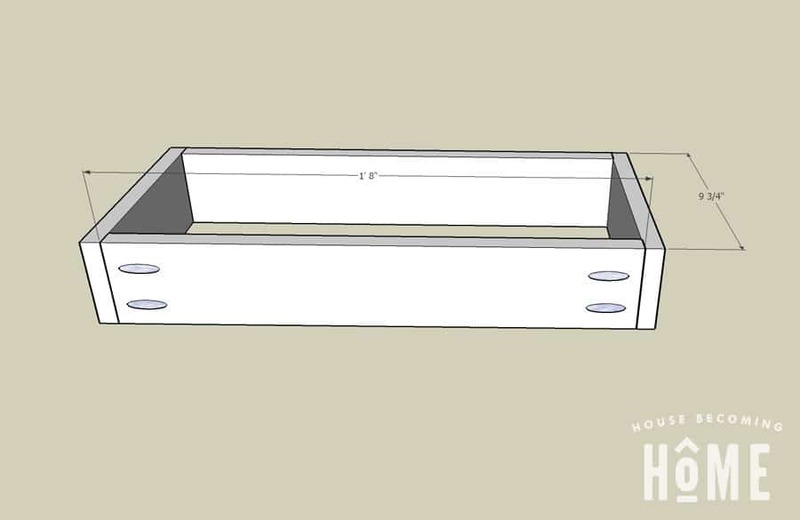 Mark the center of the drawer and drill a hole for a knob. You can buy them, of course, but I couldn’t find what I was looking for so I made some simple knobs for pennies. You can find my simple tutorial for that here. 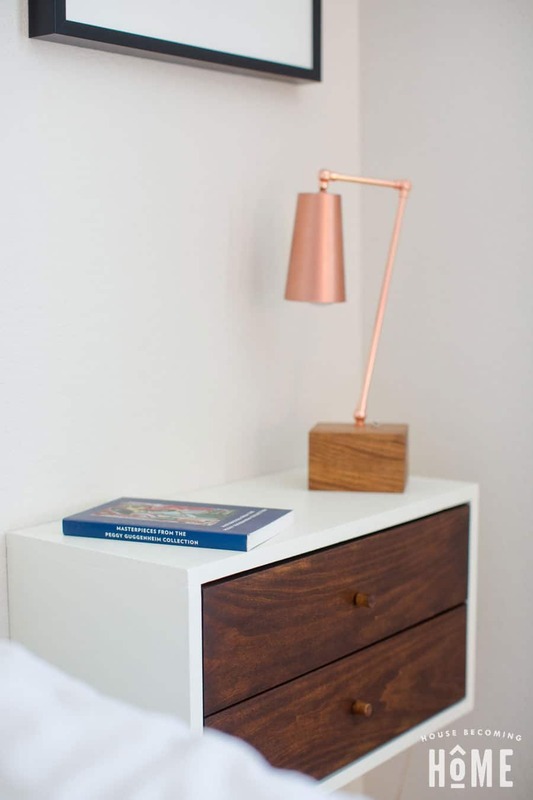 Place the nightstand on something sturdy to keep it at the height you want to mount it (I used an ironing board, adjusted to its shortest setting). 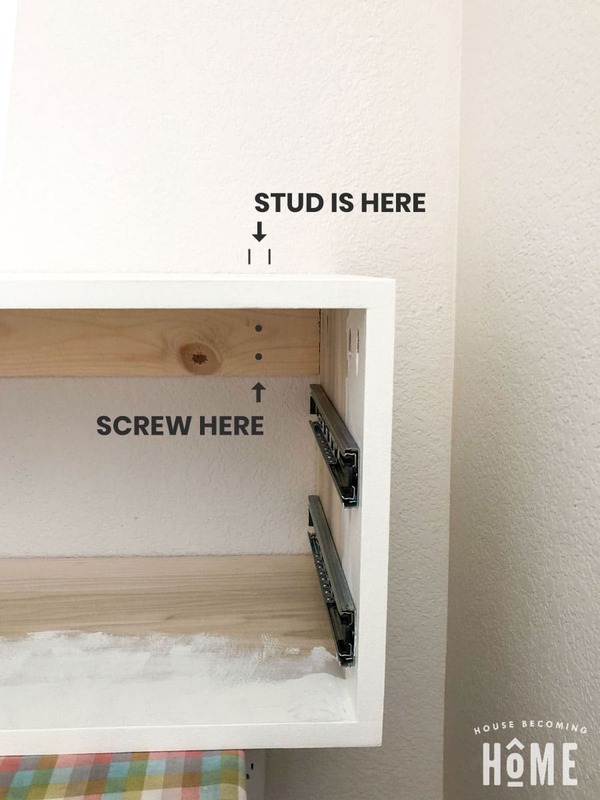 Using a studfinder, find two studs in the wall and with a pencil, make marks right above the nightstand. 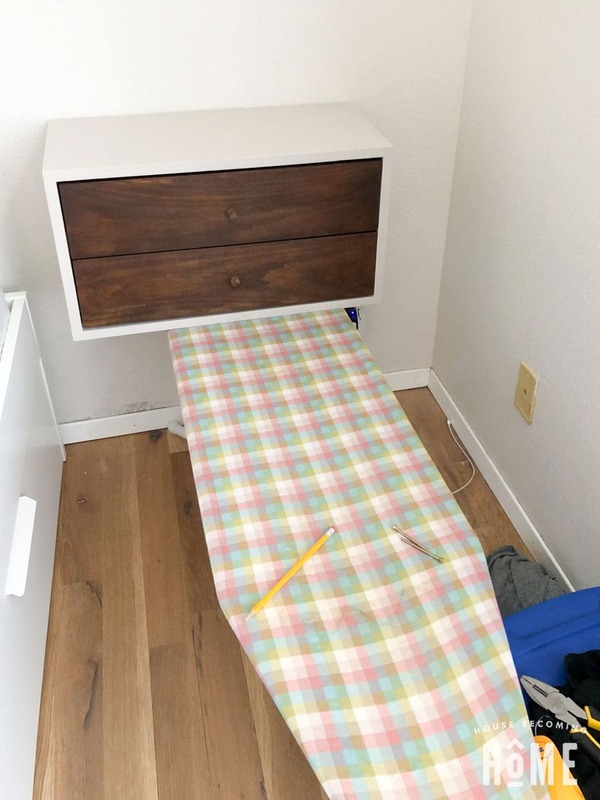 Remove the drawers. 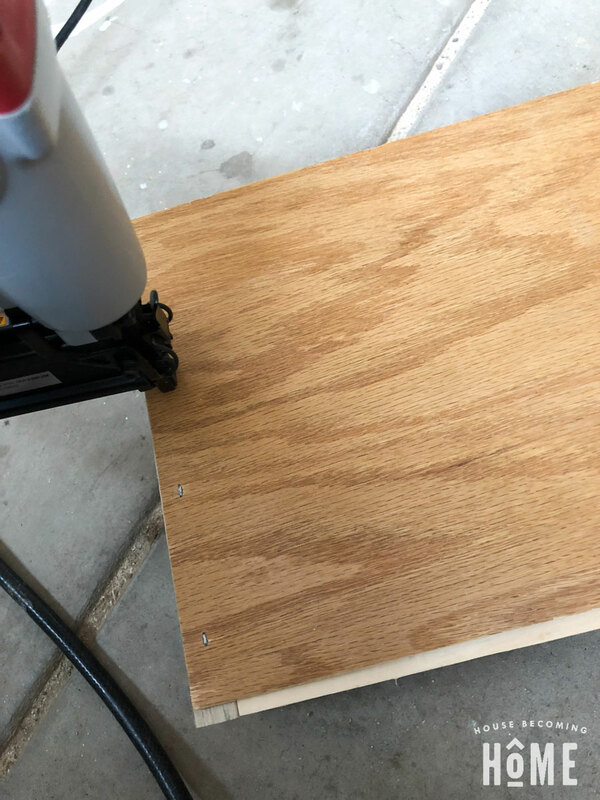 Drill several holes into the 1×4 at the back of the nightstand (reference your markings to be sure you are drilling into the studs, not just drywall) then use screws to secure into place. Put the drawers back in. 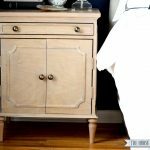 This DIY floating nightstand is all done! 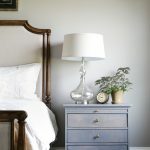 Angie Wilson has worked as a portrait and wedding photographer for the last decade, but over the last several years has fallen in love with all things home improvement–renovating, furniture-building, room-updating and home project DIY-ing. She lives in northern Colorado with her husband Jim and four children, loves searching for new recipes, travelling, the process of creating, studying art history, running 5K races, and family movie nights with popcorn! 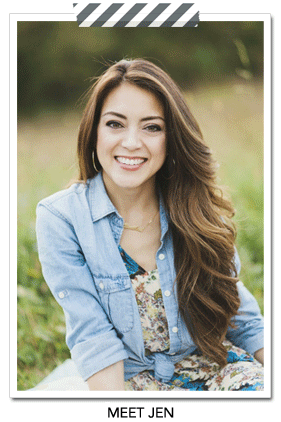 Currently she continues her work as a photographer and mom of four, and loves to share home projects on her blog House Becoming Home. 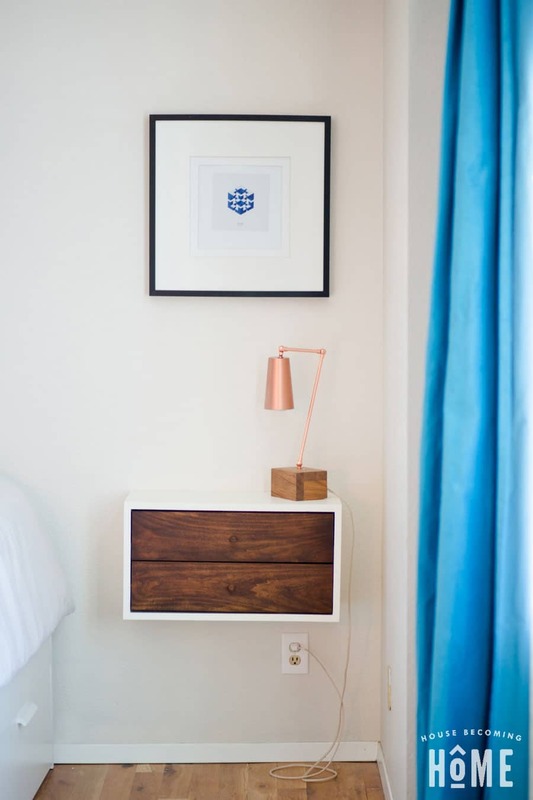 Please send me the plans for the floating nightstand with drawers. Thank you. 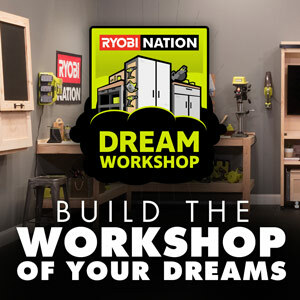 How do I print the plans? 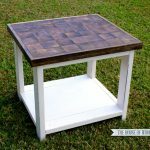 Hi Irma- I’ll work on putting something together that can be printed easily!